Visual LANSA V13 ships with Microsoft SQL Server 2012 Express (with Tools). V13 also supports SQL Server 2008 and SQL Server 2008 R2 (at the latest Service Pack level), however support for ASA 9.0 and 10.0 has ended. This means that any environments that were previously upgraded from V11 SP5 to V12 SP1 without migrating or updating the ASA database, cannot be directly upgraded to V13. ASA 9.0 and ASA 10.0 are no longer supported in V13 and the upgrade cannot continue if this is the case. See migrating a Sybase database to SQL for information on how to proceed in this instance. The easiest solution may be to install a separate V13 instance. V13 ships with SQL Server 2012 Express, and on selecting this configuration for upgrade you will be given the following prompt. As stated, please take consideration as to whether or not upgrading the existing SQL Server instance is required. SQL Server 2008 is supported in V13. However one point to remember is that LANSA will only continue supporting this database as long as Microsoft does, so there may be merit in moving to SQL Server 2012 sooner rather than later to avail of the longer period of support. 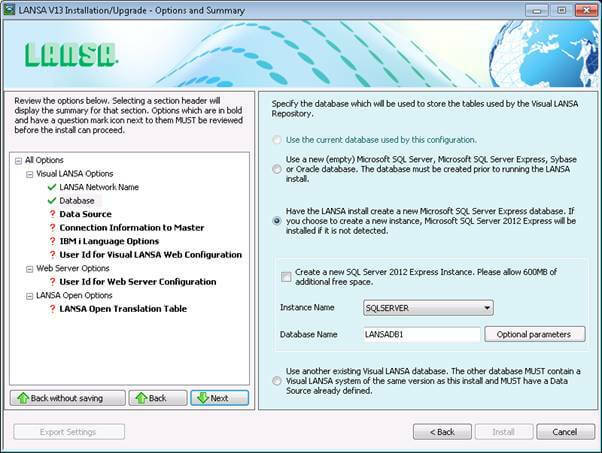 A third option is that you can install a new instance of LANSA, with a separate instance of SQL Server Express 2012, and migrate your existing SQL Server 2008 database to this post-install, as per the Sybase upgrade instructions. SQL Server 2012 can be installed alongside SQL Server 2008 on the same PC, and can have multiple separate instances running at the same time (limited only by PC resources). 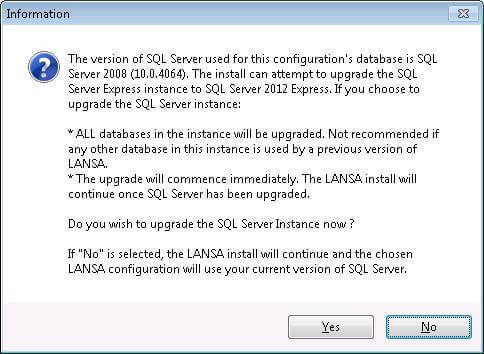 As per the dropping of support of earlier ASA versions, LANSA will only install on supported database releases. If you are not planning to use the shipped SQL Server 2012 Express database, then it is your responsibility to ensure the database software is at a compatible level. When upgrading an existing LANSA Slave system, the following prompt may be shown. Please take note and ensure all objects are checked into the IBM i server before continuing. On installing you have several options for the database. As per the note in the upgrade section, you can have multiple instances of SQL Server on one PC (including concurrent SQL Server 2008 and 2012), so it is possible to install SQL Server 2012 without affecting any existing V12 SP1 installations.